Located on the outskirts of Spondyville, on 200 acres of what used to be known as Fibromyalgia Field, Spondyberry Farm is an Amusement Park tailored to the needs and interests of the residents of Spondyville. 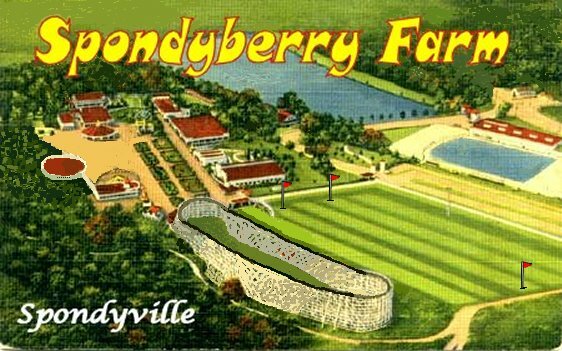 As you can see from the Postcard, Spondyberry Farm features the World Famous "Monotonater", the roller coaster designed with Spondys in mind. Just a few short feet from what has been called the "World's most boring roller coaster", is the Over-sized Miniature Golf Course, featuring the Famous "Invisible Windmill." This course uses hi-tech toaster technology to pop balls out of their holes so that Spondys don't have to bend down after a successful putt. The course also features the only Par One holes in existence. Intravenous Alley; where young Spondys can learn what it's like to get Anti-Tumor Necrosis Factor drugs, just like the grown-ups! Spondy Bumper Cars! All cars come complete with helmets, triple-extra-padding and indvidually padded driving areas. Spectator helmets also available. In the Penny Arcade, youngsters can literally bet their lives on the fun-filled Remedy Roulette!&nbsp; Or take their chances in the Video Arcade playing a rousing game of Grand Theft: Spondy. In the Nostalgic, "Days of Yesteryear" area of Spondyberry Farm, you can visit "Ye Olde Apothecary Shoppe" and sample some of the quack cures that our ancestors once used, in their futile attempts to assuage their suffering in the time before NSAIDS. Next door is the Medical Device Hall of Shame, including the old electric magnets scam from the 1890's. and the "atomic back un-fuser" from the 1950's. At the many souvenir stands, you can buy official Spondyberry Farm copper bracelets, (one size fits all), and everybody's favorite; magnet therapy key chains. "The only Theme Park designed with Spondys in mind"
In following with the Spondyville tradition, reclining bleachers and prism binoculors were provided to all residents of Spondyville who couldn't look up to see the fireworks. (Thanks to Matt for his assistance in getting this page created. ).